So far Rhiannon’s stories have told firstly of Rhiannon the bride; her pivotal decision to court and marry Pwyll, prince of Dyfed. Cleverly Rhiannon forces her previous betrothed to vow before witnesses, never to take vengeance for how he is humiliated. 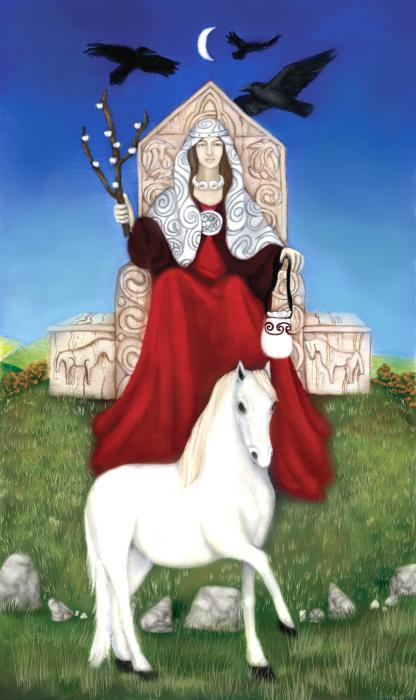 The story of Rhiannon the mother shows she is a lady of great resource and courage which is sorely tested. Her newborn son disappears and she is accused of infanticide, and cannibalism. She accepts seven years of undeserved penance, but happily the boy is restored to her. In due course Rhiannon is widowed, and her son Pryderi inherits as ruler. Those tales are the second and third episodes of the First Branch. At the end of it Pryderi conquers more territories for Dyfed, including the key stronghold of Ceredigion. He also marries Cigfa ferch Gwynn Gohoyw, the lord of Gloucester. In the Second Branch Pryderi is separated from Rhiannon and Dyfed by war, and its aftermath. Rhiannon sends her three enchanting Birds to minister to him and his companions. In the Third Branch Rhiannon has a powerful presence at times, but is just as powerful in her absence. Firstly she remarries, to her son’s great friend Manawydan. He is of the dynasty of Llyr, brother to Bendigeidfran; closely part of the royal councils, and either the heir to the throne of Britain, or a strong contender for it. He is known as one of the Three Humble Chieftains of Britain because he does not pursue his claim. Instead he lives on the bounty of Rhiannon’s son, as delegated ruler of Dyfed. Pryderi gifts Manawydan this exceptionally generous position, showing the same loyalty his father had given Rhiannon in her adversity. As he makes the gift Pryderi also arranges for his mother to marry Manawydan. Bestowing her upon a man of his choosing is a sensitive issue to the modern Westernised observer who lives within the paradigm of free marital choice. It clashes with so many aspects of Rhiannon as a decisive woman replete with agency. In the mediaeval context this is not an issue. The formal command in marriage contracts belongs to the male head of a kindred. Rhiannon’s story shows earlier how this authority overrides all other powers by her complex strategies to evade it which can only succeed to recruiting another powerful male as her ally, and forcing the unwanted one to relinquish his rights. The crux of it is expressed when she acknowledges that Pwyll must ‘give’ her to another man. The Mabinogi recognises how Rhiannon’s formidable nature militates against this tradition. The text delicately resolves the tension by a courtly scene in which Rhiannon and Manawydan meet, and take a liking to each other. A somewhat wry commentary has Pryderi referring to his mother’s advanced age and assuring his friend that she is still very beautiful. Considering the Seven Survivors had been away for the best part of a century, Rhiannon’s loveliness is indeed remarkable. Either the long sojourns of her son in enchantment were like trances which took up little time in the conscious ‘real’ world, or else Rhiannon again warps the dimensions as she did with her horse’s speed, and the Birds’ faraway proximity. In any case, Pryderi remarks also on his mother’s grace in companionship, reminiscent of the Queen of Annwfn.